Vegetable Shaslik$11.99 Gluten Free - Clay oven skewered Indian cheese, zucchini, peppers, mushrooms and onions. Beef Samosa$4.99 Pastries filled with lean Beef, Green peas & spices. Jackfruit Pakora$6.95 Gluten Free - Jackfruit marinated with lemon juice, ginger, garlic and batter fried. Sabz Khazana$10.99 Combination of vegetable fritters, samosas, paneer pakoras, aloo tikki, etc..
Chicken Pakora$8.99 Marinated tender chicken, coated with crispy batter. Gobi Manchurian$8.99 Crispy cauliflower florets in garlic and soya sauce. Calamari$9.99 Garlic flavoured Calamari a fusion of East and West. Vegetable Samosa$3.99 Pastries filled with fresh potatoes & green peas. Chicken Samosa$4.99 Pastries filled with Tandoori chicken mix. Vegetable Pakora$5.99 Gluten Free - Vegetable fritters coated in crispy batter. Paneer Pakora$8.99 Gluten Free - Indian stuffed cheese coated in crispy batter. Ragda Patties Chaat$8.99 Flavourful and seasoned potato patties served with chickpeas. Chicken Apricot Kebabs$13.99 Gluten Free - Tender rolls of chicken blended with apricot, herbs and spices. Fish Pakora$8.99 Marinated Fish morsels, coated with crispy batter. Chilli Chicken$8.99 Chicken tenders with a touch of Indian and Chinese flavour. Chilli Fish$9.99 Marinated white fish, onions, peppers tossed in Indo - Chinese flavour. Chilli Paneer$8.99 Home-made cheese with a touch of western Indian flavours. Kairali Mussels$9.99 Gluten Free - Fresh mussels tossed with garlic, curry leaves and coconut milk. Chicken Lettuce Wrap$11.99 Gluten Free - Chicken tossed with sesame seeds, chilli garlic sauce and served with fresh lettuce. Paneer Lettuce Wrap$10.99 Gluten Free - Paneer tossed with sesame seeds, chilli garlic sauce and served with fresh lettuce. Coconut Prawns$9.99 Prawns batter fried with fresh coconut & served on baby greens with touch of mango. Chaat Papri$6.99 A popular Indian snack made from mixture of potato pieces, crispy chips, chickpeas and tangy-Indian spices. Chole Bhature$7.99 The flavorful dish from Punjabi cuisine. A combination of chickpeas and fried flatbread. Kachumber Salad$5.99 Garden fresh vegetables in salt, pepper and lemon juice dressing. Tandoori Chicken$13.99 Spring chicken marinated overnight then broiled in clay oven. Chicken Tikka$13.99 Succulent chicken breast marinated and delicately simmered in clay oven. 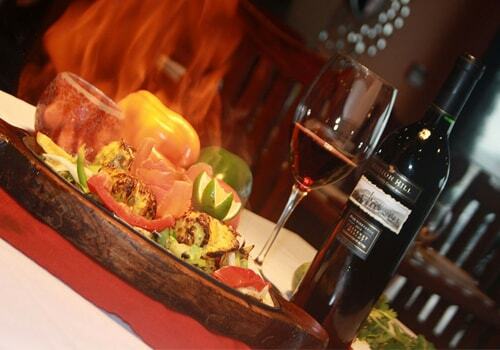 Tandoori Prawns$14.99 Tiger prawns marinated in exquisite Indian spices and cooked in clay oven. Afghani Chicken Tangri$14.99 Chicken drumsticks marinated with ginger and homemade yogurt. Lahori Boti$14.99 New Zealand boneless lamb marinated and cooked in tandoor. Mixed Grill Affair$18.99 Combination of various tandoori delicacies served on a sizzling plate. Gilafi Seekh$13.99 Tender rolls of minced lamb cooked with fresh onions, pepper and Indian herbs. Tandoori Salmon$16.99 Mouth-watering Salmon marinated and cooked to perfection in Clay oven. 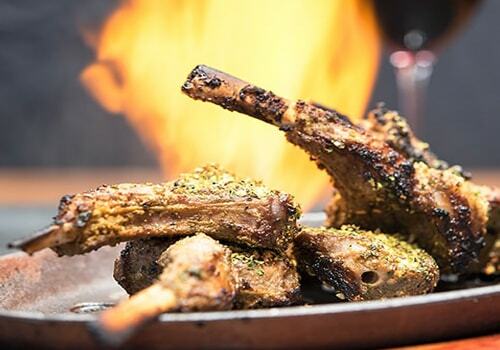 Lamb Chops$16.99 Delicately spiced and marinated New Zealand Lamb rack cooked in clay oven. 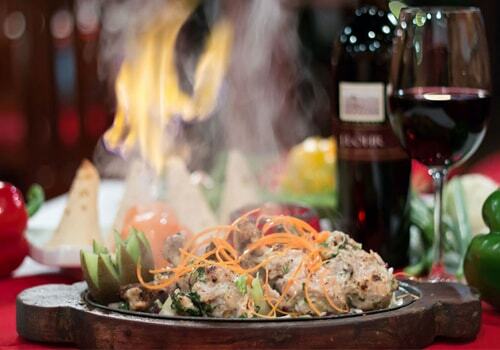 Chicken Tikka Achari$14.99 Succulent Chicken breast marinated in pickle flavour and delicately cooked in clay oven. Kalmi Tikka$14.99 Chicken breast marinated with hang curd, spiced mildly with cardamom flavour. Paneer Tikka$11.99 Mouth-watering marinated and grilled Indian cheese. Daal Makhani$11.99 Black Lentils cooked overnight on a slow fire with herbs. Yellow Daal$11.99 Yellow lentils cooked with onion, tomato and flavour of garlic. Mutter Paneer$11.99 Indian cheese cooked with green peas, onion and tomato in a curry sauce. Shahi Paneer$11.99 Indian grated cheese cooked with tomatoes and onion based cream sauce. Palak paneer$11.99 Indian cheese cooked in fresh baby spinach and spices. Khatte Meethe Baingan$11.99 Baby egg plants prepared with sweet and sour onion tomato sauce. Paneer Makhani$11.99 Indian cheese cooked in rich tomato and cream sauce. Chana masala$11.99 Chic peas cooked in onions and tomatoes spiced with ginger and garlic. Aloo Gobi$11.99 Home made style cooked cauliflower and potatoes. Malai Kofta$11.99 (Has Gluten)Dumplings of cheese, vegetables, raisins and cashews in curry based sauce. Baingan Bharta$11.99 Baked eggplant cooked with onion, tomatoes and herbs. Kadai Subz$11.99 Farm fresh vegetables sautéed in curry based sauce. Vegetable Korma$11.99 Fresh vegetables and Indian cheese cooked with cashewnut based Curry sauce. Tawa Mushroom$11.99 Mushrooms and peppers sautéed with a touch of curry. Okra Masala$11.99 Freshly cut okra with onion and tomatoes cooked in roasted spice. Paneer Tikka Masala$11.99 Indian tandoori cheese cooked with onions and peppers in masala sauce. Shabnam Curry$11.99 Peas, mushrooms and homemade cheese cooked in cashew sauce. Butter Chicken$12.99 Famous !!! marinated chicken cooked in a tomato based sauce. Chicken Tikka Masala$12.99 Tender chicken tikka cooked with onions, tomatoes, pepper, and ginger. Chilli Chicken$12.99 Chicken tender with a touch of Indian and Chinese flavours. Chicken Vindaloo$12.99 Chicken and potatoes cooked with tangy curry sauce. Chicken Korma$12.99 Chicken cooked with yogurt, nuts and spices in mild Northern sauce. Kadai Chicken$12.99 Street food style cooked boneless chicken. Palak Chicken$12.99 Boneless chicken cooked with fresh spinach and ginger. Chicken Chettinaad$12.99 Chicken cooked with coconut milk and flavoured with curry leaves in southern Indian style. Mango Chicken$12.99 Chicken folded in velvety mango curry topped with crackling mustard seed and fresh curry leaves. Chicken Curry$12.99 Boneless chicken cooked with traditional curry based sauce. Kadai Lamb/Beef$13.99 Traditional street food delicacy. Anaari Gosht$13.99 Lamb/Beef cooked with onions, tomatoes, garam masala and splash of pomegranate juice. Lamb/Beef Korma$13.99 Traditional style Lamb/Beef cooked with cream, dry fruits and seed paste. Fenugreek Lamb/Beef Curry$13.99 Lamb/Beef cooked with fenugreek leaves, peppers, onions, ginger, garlic and garam masala. Lamb/Beef saag$13.99 Lamb/Beef cooked in fresh baby spinach and spices. Malabari Lamb/Beef$13.99 Lamb/Beef cooked in coconut milk with curry leaves and onions in southern Indian style. Lamb/Beef Vindaloo$13.99 Lamb/Beef and potatoes cooked together in tangy hot sauce can be made mild on request. Lamb/Beef Rogan Josh$13.99 Traditional Lamb/Beef cooked with garam masala and yogurt based curry. Goat Curry$13.99 Chef's Special! 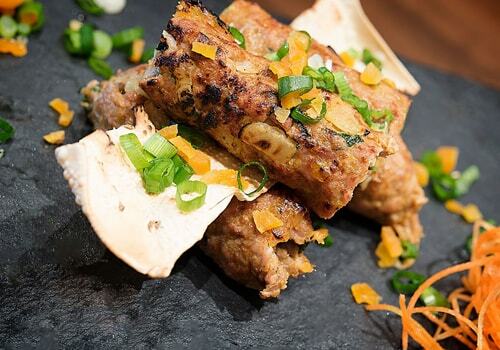 Mouth watering goat marinated and cooked in authentic Indian spices. Allepy Fish Curry$14.99 Kerela style Fish Cooked in coconut milk tempered with curry leaves and mustard seeds. Butter Prawn$14.99 Prawns cooked with ginger garlic and creamy butter sauce. Affair Malai$14.99 Prawns Cooked with fresh young coconut cream served in young coconut. Prawn Tikka Masala$14.99 Tandori Prawns cooked with onions, tomatoes, pepper, and garlic. Fish Vindaloo$14.99 Fish Cooked with potatoes and tangy spicy sauce, can be made mild on request. Prawn Vindaloo$14.99 Prawn Cooked with potatoes and tangy spicy sauce, can be made mild on request. Tantalizing combination of Fresh Vegetables, Tomatoes, Ginger, Herbs, Spices and Aromatic Basmati Rice. Biryani's are Served with Your Choice of Shrimp, Lamb, Chicken or Simply Vegetarian. Peas pulao$4.99 Rice cooked with fresh green peas. Kashmiri pulao$4.99 Rice cooked with dry-fruits and fresh fruit. Coco Rice$4.99 Rice cooked with fresh grated coconut. Plain Naan$1.75 Leavened bread baked in clay oven. Garlic / Basil Naan$2.25 Tandoori bread topped with garlic and basil flavour. Palak Paneer Naan$3.25 Bread stuffed with spinach and cheese. Chicken Naan$3.25 Bread stuffed with pieces of chicken tikka and onion. Keema Naan$3.25 Bread stuffed with lamb mince, onions and cilantro. Peshawari Naan$3.25 Bread stuffed with dry fruits. Roti$1.95 Whole wheat bread baked in clay oven. Paratha$2.75 Layered whole wheat bread. Onion Kulcha$3.25 Bread stuffed with Onions and cilantro. Family Naan$5.50 Family sized leavened bread baked in clay oven. Garlic Family Naan$5.95 Family sized leavened bread topped with garlic and basil flavour baked in clay oven. Plain yogurt$3.99 Fresh home-made plain yogurt. Mixed Raita$4.25 Yogurt with grated mixed vegetables and spices. Gulab Jamun$4.95 Sweet milk dumpling honey and rose syrup. Ras Malai$4.95 Sweet milk patty dipped in flavoured milk sauce. Mango Kulfi$4.95 Homemade Indian mango ice cream. Coconut Ice cream$4.95 Homemade fresh coconut ice cream. Kulfi Falooda$5.95 Rich creamy Kulfi ice cream topped with falooda and rose syrup. Delhi Special$4.95 Hot gulab jamun served with vanilla ice cream. Mishti Doi$5.95 Cardamum flavoured Bengali styled cheese cake. A Chocolatey Affair$5.95 Cardamom flavoured fudge and brownie topped with ganache combination served with homemade mango ice cream and fruit. Vegetable Shaslik$11.99 Clay oven skewered Indian cheese, zucchini, peppers, mushrooms and onions. Jackfruit Pakora$6.95 Jackfruit marinated with lemon juice, ginger, garlic and batter fried. Nashilli Prawns$9.99 Prawns cooked in wine & served on baby greens with touch of mango & mint. Vegetable Pakora$5.99 Vegetable fritters coated in crispy batter. Paneer Pakora$8.99 Indian stuffed cheese coated in crispy batter. Chicken Apricot Kebabs$13.99 Tender rolls of chicken blended with apricot, herbs and spices. Chilli Chicken$8.99 Chicken tender with a touch of Indian and Chinese flavour. Kairali Mussels$9.99 Fresh mussels tossed with garlic, curry leaves and coconut milk. Chicken Lettuce Wrap$11.99 Chicken tossed with sesame seeds, chilli garlic sauce and served with fresh lettuce. Paneer Lettuce Wrap$10.99 Paneer tossed with sesame seeds, chilli garlic sauce and served with fresh lettuce. Kachumber Salad$5.99 Home-made cheese with a touch of western Indian flavours. Malai Kofta$11.99 (Has Gluten) Dumplings of cheese, vegetables, raisins and cashewnut curry based sauce. Ragda Patties Chat$8.99 Flavourful and seasoned potato patties served with chickpeas. Aloo Gobi$11.99 Home made style cooked cauliflower and potoes. Aloo Bhaji$11.99 Potatoes and peas cooked with onion and tomatoes. Gajjar Mattar$11.99 Carrot and peas cooked in curry sauce. Zuccini Masala$11.99 Fresh squash cooked with chef special spices and curry sauce. Diabolica$30 (VQA) Off Dry 02 B.C. Mission Hill$32 Cabernet Merlot - Dry B.C. Chaberton Bacchus$32 (VQA) Off Dry 01 B.C. Blasted Church$32 Hatfield's Fuse Off Dry 01 B.C. Mission Hill$34 Pinot Grigio - Dry B.C. Mango Sensation$7.50 Vodka, Mango Juice, Lemonade. Mai-Tai$7.50 Vodka, Pineapple Juice, & Lime. Caesar$7.50 Vodka, Lime Juice, Clamato Juice, Tobasco. Gary's Favorite$8.50 Tequila, Corona, Ginger and Lime. Moscow Mule$7.50 Ginger Beer, Vodka, Mint, Lime. Peach Bellini$7.50 White Rum, Frozen Peach Puree & Champagne. Tropical Paradise$7.50 Vodka, Orange Juice, Pineapple Juice, Grenadine. Long Island Ice Tea$7.50 Vodka, Tequila, Rum, Gin, Cola, Triplesec. Bombay Ginger Mint$7.50 Gin, Ginger Ale, Mint. We also serve Dine-In, Take-Out & Home Delivery. * Please let your server know if you have any allergies or intolerance, we will be happy to tailor or create a dish to suit your needs.